You may be surprised by this fact: only 10% of the time, our skin ageing process is dependent on “natural reasons” such as chronological ageing (the fact that we grow older with time) and genetics. According to the Canadian Dermatology Association, 90% of the time, skin ageing is caused by the effects of UV exposure from the sun. This is also known as photo-ageing. How does photo-ageing damage our skin? There are three types rays that are present in UV radiation: UVA, UVB and UVC. UVC are cancer-causing rays, but they are usually filtered out by the ozone layer. UVB are the shortest rays and are responsible for sunburn. Therefore, what we are more worried about are the UVA rays, which have longer wavelengths and are the culprits behind photo-ageing. UVA rays are able to penetrate more deeply into skin because of their longer wavelengths, and so they are able to damage collagen fibres that are found within the deeper layers of skin. Faced with this damage, our skin produces an abnormal amount of elastin as a response, and also enzymes that rebuild the damaged collagen. However, the process doesn't ensure skin is built uniformly. Wrinkles are formed and this, coupled with collagen loss, results in leathery-looking skin, and/or sagging skin. But this is not the only damage UVA can bring. Repeated exposure to UVA can also cause pigmentation on the skin such as age spots, freckles or brown spots, as well as a dull or uneven complexion, which add to an overall aged appearance. What can we do to guard against it? The biggest skin mistake you can make is to go for a tan, whether it is indoors or outdoors. Both methods expose you to UV rays and directly damage your skin. Remind yourself: sun exposure is your skin's greatest enemy. Try: If you really want to warm up the appearance of your complexion, try tanning sprays for the body and bronzer for your face. These are safe for your skin, and are also temporary solutions that you can stop using if you don't feel like rocking the sun-kissed look anymore. Wear a broad spectrum sunscreen of at least SPF30, which guards against both UVB and UVA, even if you're staying indoors most of the time, for example, on a typical work day in the office. UV radiation can penetrate through windows, so you're not entirely safe when you sit by the window on the car or bus, or if you have windows in the office. If you're heading outdoors, make sure your sunscreen has at least SPF50. Remember to reapply it, especially if you've gone swimming or may have rubbed it off with your hands or a towel. Additional tips: Don't neglect areas such as your ears, hands, neck, and lips; look for lip balms that have sun protection properties. 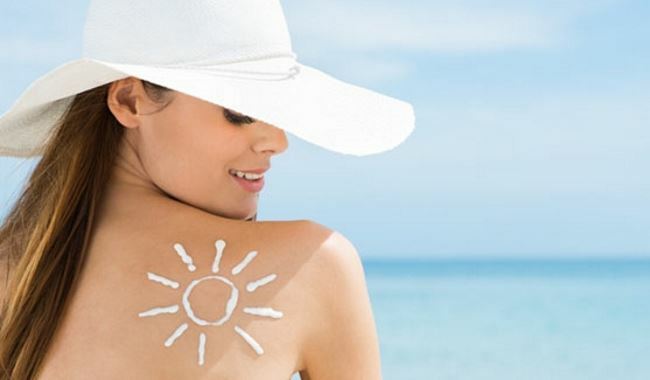 While it's never too late to start practising good sun care habits that we've mentioned above, your skin might have already suffered from damages caused by sun exposure in the past. To visibly diminish these effects, invest in facial treatments that are able to effectively repair skin from the effects of photo-ageing. Try: The Photo-Ageing Repair Therapy by Bella Marie France. This 40-minute treatment promotes collagen and elastin synthesis to boost the collagen loss that UV damage has brought about to your skin, causing your skin to look and feel less firm. On top of this, it also restores damaged skin cells and improves their metabolism, so your complexion looks more luminous, and the appearance of wrinkles are smoothed out. If sun damage has caused visible hyper-pigmentation or brown spots on your skin, this facial treatment promises to lighten their appearance.